Children love to learn and are quick to absorb new knowledge, but to ensure their new knowledge is long-lasting requires review and repetition. It is important to regularly check your kids’ knowledge to see if they are remembering all the great things you are teaching them. Using games as a way of review can make it fun for you and your children. This is a game based on the TV game show Wheel of Fortune which you can play in your Sunday School classroom to revisit past lessons and memory verses learned. After you have played it once with your class it will be easy to set up and play on a bi-monthly or quarterly basis to check that your teaching has taken root in the hearts and minds of your children. Divide the class up into three evenly matched teams. Write “blanks” across the large chalkboard or whiteboard. There should be one “blank” (an underline) for each letter and/or number in the puzzle. This is just like in the popular game Hangman. Announce to the teams the category being used for the puzzle. It could be the category Bible Fact, Memory Verse, or any other category you think fitting for your previously taught lessons. Each team will choose one representative to step up to their team’s podium or desk. 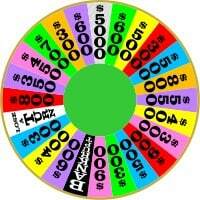 The team representative from Team #1 will spin the wheel and guess a letter. If the guessed letter is part of the puzzle the teacher will write the letter in every place it appears in the puzzle. The teacher will then write the team’s score on the scoreboard. For example, if the team member spun a “5”, guessed an “L”, and the puzzle had three “L’s”. Then the team would be awarded 15 points. If during their turn a representative would like to guess a vowel, then it will cost their team 5 points. This 5 point penalty is a flat rate and is not determined by the numbered of guessed vowels in the puzzle. The representative from Team #1 will continue to spin and guess letters until their guessed letter is not a part of the puzzle or they have solved the puzzle. Their turn is then over and they take a seat back with their team. The Team #2 representative then participates in steps 5-9. The Team #3 representative then participates in steps 5-9. The teams then choose one new representative for the next round of play to carry on steps 5-11 until the puzzle is solved. Play continues like this until one team representative is able to solve the puzzle while in possession of the spin. When all puzzles have been used the team with the highest score is the winner. It is up to the teacher whether to award prizes to the winning team or just allow them the satisfaction of knowing their facts and verses. You may want to allow the team representative to converse with their team when trying to solve the puzzle as this would include a greater number of students to be active in the game. Tony Kummer (Editor) reviewed & updated this page on : September 27, 2010 at 1:35 pm. All our content is peer reviewed by our readers, simply leave a comment on any post suggest an update.